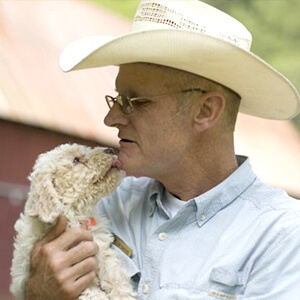 Jim Sanford is a truffle dog handler/trainer for the Blackberry Farm, a 4200 acre luxury resort in Eastern Tennessee. After twenty years of handling and training elephants and another nine years training horses, in 2007 Jim shifted his focus to working with truffle dogs, in part due to the fact that the Blackberry Farm now has its own truffiere, planted in 2008 with trees purchased from Dr. Charles Lefevre. During the winter of 2008/2009, Jim and his dogs found 200 pounds of the Perigord truffle at an eight year old truffle plantation in Tennessee. Jim has eight Lagotto Romagnolo Italian truffle dogs, one of whom will accompany him to the truffle festival for the training seminar. The Lagotto Romagnolo is a breed of dog that traces back to the 16th century in Northern Italy. Originally used as a waterfowl hunting dog, for the last 150 years it has been the breed of choice for finding truffles. They have a sharp aptitude for searching, an unbeatable sense of smell, and are fairly easy to train. They are very loyal to their owners, and get along well with people and other dogs.